N, N-dimethyl acetamide Molecular formula: CH3CON (CH3) 2. Molecular weight: 87.12. Chromatography content ≥ 99.9%; water content PPm ≤ 100; acid (as HAC) PPm ≤ 80; alkali content (as DMA) PPm ≤ 5; Fe PPm ≤ 0.05; conductivity (20 ℃) μs / cm ≤ 0.5. Chromatography content ≥ 99.6%; water content PPm ≤ 300; alkali content (as DMA) PPm ≤ 20; Color Pt-Co ≤ 10. 1 acrylic, aramid, spandex spinning solvent. (2) pharmaceutical intermediates, pesticide intermediates, the reaction solvent. 3. Polyimide insulating material, polyimide film of the solvent. Production molded high temperature electronic materials and electronic components of the solvent; for the production of high-grade polyimide film, the soluble polyimide, polyimide - FEP composite polymer membrane, soluble polyimide molding powder the solvent. 4 polypropylene hollow fiber membrane, PVDF hollow fiber membrane, blending PES hollow fiber membrane solvent. 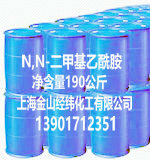 N, N-dimethylacetamide Packaging and storage: Net Weight 190 kg / drum or 10,000 kilograms dedicated tank. N, N-dimethylacetamide should be kept sealed in a cool dry place, avoid water and sunlight, not near the fire, handling should beat.